You are here: Home / Home Page / The Plantwhacker Wins! For years, while mercilessly killing non-native invasive plants at Long Branch Nature Center, I have harbored the admitted fantasy that the invasives’ removal will magically reveal some cool, unexpected native plants. And to be sure, I have seen some nice native plants and have been able to track how many of them respond positively to the removal of the invasives. For example, native tree seedlings pop up again in places where they were choked out before. Plants like mayapples poke up happily in vigorous patches where the invasives are gone. A few days ago, as I enjoyed whacking dense ground webs of Japanese Honeysuckle, something caught my eye. Around me were many white-flowering plants of star, or great chickweed, an under-appreciated native. But this white-flowered plant was different. A vague memory offered up – dwarf ginseng. Twelve years ago, in a place I removed truly monumental amounts of invasives, especially multiflora rose and burning bush from a spring/seep area, someone found a single dwarf ginseng plant that popped up there. But the plant was never seen again after that spring until this year. 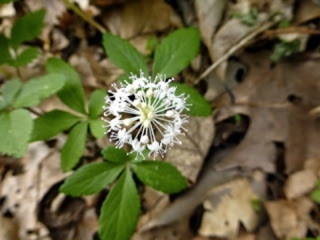 A quick Google search confirmed that this was dwarf ginseng and as I looked around, there were more. More flowering individuals, and little seedlings, too; a whole colony was there, perhaps two dozen flowering individuals, plus the seedlings. I walked into the nature center building with a chip-eating grin on my face and announced my find. I’ve now shown it to County staff, and we are confident in the identification. This spring also revealed two other another rare-for-Arlington finds, wood anenome, and carrionflower greenbriar, plus one of only two known Arlington occurrences of Melic Grass. So I think it’s a really special little place that survived the invasive onslaught and can now regenerate. Who knows what else might be hidden away in there? This makes my crazy plantwhacking feel so worthwhile. It’s what I have hoped for even though Long Branch has not been considered to be a top Arlington site for native plant diversity. So shall I disclose my nuttiest fantasy related to invasive plantwhacking? The small whorled pogonia is an endangered species of orchid found in only a few places in the mid-Atlantic. There is some evidence that it tolerates and may even need a little light soil disturbance. I like to think of it as the “small world pogonia.” My fantasy is that it will turn up some day at Long Branch, popping up somewhere that had been an invasives hell. OK, it is a fantasy, but it doesn’t feel quite as far-fetched as it did a week ago.